Fat Ox offers a truffle filled weekend in the Italian countryside, kind of. Just back from northern Italy executive chef & co-owner Matt Carter is wasting no time showing off his bounty. It’s truffle season and Carter’s putting together an Italian inspired dinner using the white and black treasures. The dinners will be on a special menu from Thurs. Nov. 8th – 11th. The rustic Italian dinner will take Carter back to his recent expedition in the Italian countryside. Fat Ox is at 6316 N. Scottsdale Rd. Scottsdale 85253. Posted on November 1, 2018 Categories Arizona, award-winning, chef driven restaurant, dinner, fine dining, food news, Italian food, Italy, local, new menu, restaurant news, Scottsdale, special menuTags Arizona, black truffle, Chef Matt Carter, dinner, Fat OX, food, foodie, Italian food, Italy, local, local restaurant, Scottsdale, special menu, truffle hunting, truffle season, white truffleLeave a comment on Fat Ox offers a truffle filled weekend in the Italian countryside, kind of. Rondinella is a red grape found in the northern part of Italy, in the Veneto region. It’s usually blended with the Corvina grape. It is used to make Valpolicella and Bardolino wines. Pedro Ximinez (PX) is a white grape found in Spain and is used to make sweet, dessert style Sherry. It’s also found in Chile and Argentina where it’s the most widely white grape there. It’s also grown in Australia where it’s used to make fortified wines. Originally found in the Canary Islands it was brought to Spain by a soldier named… Pedro Ximinez. Tannat is a red grape found in the southwest part of France and it’s also the most widely planted grape in Uruguay. It’s also found in other countries in South America and experimented with in Virginia and is seeing increased plantings in California. In France it’s usually blended with fuller bodied wines to soften it up and make it more drinkable. Tannat has raspberry overtones and can age well. In Uruguay it has more blackberry overtones and softer tannins with more elegance. Posted on October 19, 2011 Categories France, grapes, Italy, Sherry, Spain, Uruguay, wineLeave a comment on What grape is that…..? In a continuing effort to familiarize people with lesser known varieties of grapes grown around the world I present you with this next installment. PLOUSSARD also called POULSARD is a thin skinned grape found in the Jura region of eastern France. It’s light color makes it ideal for Vin Gris and even for making of white wines. FRAPPATO is a red grape found mostly on the island of Sicily and is related to Sangiovese and other Italian varieties. It’s a lighter bodied wine with fruity aromas. Coincidentally, there is also a Italian white grape called FRAPPATO too. AIREN is a white grape found mostly Spain and has the distinction of being the most widely grown grape in the world. NORTON is native to North America and is a red grape found mostly in Mid Atlantic and Mid Western region of the United States. It’s the state grape of Missouri and widely planted in Virginia. Posted on August 24, 2011 Categories France, grape, Italy, Jura, Missouri, Sangiovese, Sicily, Spain, United States, Virginia, wineLeave a comment on What grape is that….? Some of the most exciting new wines coming to the United States are the delicious and racy wines from Eastern European countries such as Croatia & Slovenia. Situated on the north and eastern side of the Adriatic Sea and across from Italy both countries have centuries of wine making tradition that has only recently become evident in the U.S. Making both wines from grapes only found in their respected countries and grapes that are internationally known, both Croatia and Slovenia wines are being widely accepted by great retailers and restaurants around the country. Many are practicing natural methods of wine making using only grapes and natural yeast, which allows for the terroir to speak through the wine. So don’t be surprised to see some of these wines at your local wine shop or restaurant. And more importantly give them a try. Coronica Malvasia is a crisp, acidic white wine that offers good fruit, minerality and is a well balanced food wine. Grown in nutrient rich soil & near the sea, it benefits from the Mediterranean climate found in the Istrian region of northern Croatia. This wine would go great with both fish and lighter fare foods. Retails for about $20. 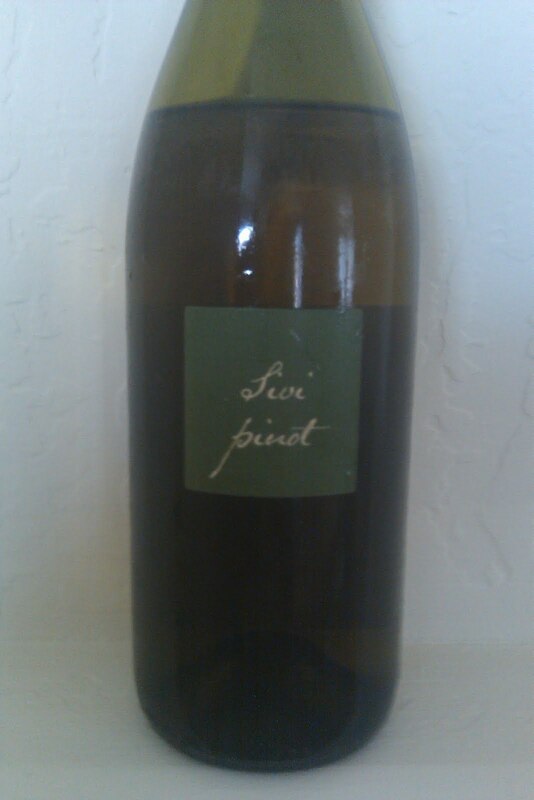 Kabaj Sivi Pinot is known as pinot grigio outside of Slovenia and is made by Frenchman Jean Michel Morel and his wife Katja Kabaj at there western Slovenian winery, not far from Collio Italy. The Kabaj family has been selling grapes for generations and only started making wine in the 1993 after Slovenia disbanded from Yugoslavia. With vineyards near the Italian border, Kabaj makes wine in a very old world style using clay vats (called “Qveri amphora”) for fermenting and aging in some of their wines. This full bodied pinot is crisp, lively and dry also shows good fruit and complexity rarely found in pinot grigio’s. It is aged for a year in oak and held back 3 years prior to release. It would go well with shellfish, cheese’s and fruits. Retail is about $20. Pomo Pizzeria Napoletana is molto bene(very good)!! Every so often a restaurant comes along that’s all the rage. Usually it has a celebrity chef in the kitchen, some unique concept or cuisine or delicacies. They tend to be trends for a year or two until the next one comes along. Rarely is all the rage about something simple say…. pizza. Yes, pizza. Dough, tomato, cheese & sometimes toppings. Phoenix has a lot of really good pizza establishments, some award winning and some just really good. Most have their claim to fame of wood burning oven, coal burning oven, ingredients direct from Italy, locally grown ingredients, etc, etc. Along comes Pomo the most recent entry into the Phoenix pizza scene. It was brought to my attention by a friend of mine who does not like pizza because he remembers his days studying in Italy and the pizza he had there. Phoenix has never had the traditional very thin crust that needs to be eaten with a fork and knife. He’s been there no less than 10 times and I’ve been there 3, but who’s counting. And Pomo has only been around for less than 3 months. Located at The Borgata in Scottsdale(Scottsdale Rd. & Rose Ln.) in a spot that has been a revolving door of restaurants in years past, Pomo is sure to see that the revolving door has stopped revolving. The generous menu of antipasti, insalate(salads), panini(sandwich) and pizza’s. 14 pizza’s with sauce and various toppings and 6 Pizze Bianche(white pizza)and something you don’t see very often, fried pizza. Owned by native Italian, Stefano who had a desire for true authentic pizza of his homeland. So authentic so it’s certified by Vera Pizza Napoletana Assoc. following there guidelines and that of Italian government and European Union. Do they take there pizza seriously or what in Italy! Pizzas take only 60-90 seconds in the 950 degree wood burning oven. Most of the ingredients…flour, tomatoes, bufala mozzarella, extra virgin olive oil & Parmigiano Reggiano are imported from their respected regions in Italy. Upon my visits we’ve had for starters caprese(mozzarella ,tomatoes & basil), bruschetta(homemade bread,tomatoes, extra virgin olive oil and even tried a frita(fried pizza). The thin crust and quick frying really gives this a unique taste and way to eat folded dough, cheese & sauce. As for pizza’s on one visit we kept it simple with Regina Margherita($11.95) San Marzano tomatoes, mozzarella, fresh basil and Parmigiano Reggiano. we also enjoyed Bufala($16.95) using the same ingredients as the Margherita except the mozzarella come from buffalo milk, not cow’s milk. and yes you can taste the difference. On another visit we chose the Donna Rosa($15.95) a white pizza using homemade pesto sauce and topped with roasted shrimp. mozzarella and cherry tomatoes. On of my favorites is the Capricciosa($14.95) which is topped with artichoke hearts,prosciutto sauteed mushrooms,cotto(ham)and Gaeta olives. Molto bene, molto bene!! On 2 occasion we saved room for dessert and we tried tiramisu($7.95) an Italian classic that is light, fluffy and soaked in espresso. I would also recommend the Croccante($7.95) a nut basket filled with mascarpone cream and topped with fresh, seasonal fruit. It reminded me of a toasted almond bar that I loved as a youth. Pomo also has a diverse, mostly Italian wine and beer list and some mostly Italian spirits. So sometimes all the rage can be targeted at something so simple and easy that it gets often overlooked. It’s a good thing Pomo is opened 7 days a week from 11am-9pm Sun.-Thurs and until 10pm on Fri. and Sat. Pomo is located at 6166 N. Scottsdale Rd. in Scottsdale 480-998-1366. 4.5 corks out of 5 corks!! Posted on July 16, 2010 Categories Italy, pizza, ScottsdaleLeave a comment on Pomo Pizzeria Napoletana is molto bene(very good)! !